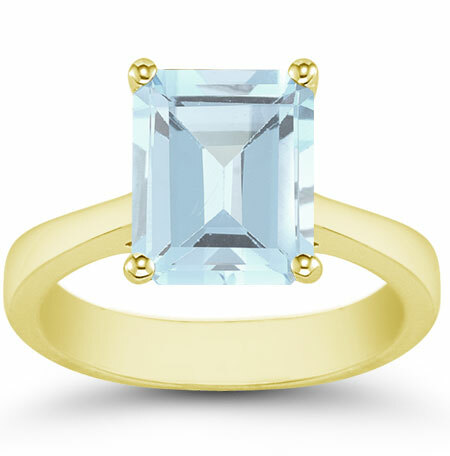 Aquamarine is sure to become a new favorite stone in this emerald-cut aquamarine solitaire ring in 14K yellow gold! This A rated gemstone from Apples of Gold Jewelry is authentic as well as beautiful! The icy blue color of the aquamarine will capture the light and glitter, and the 8mm x 6mm emerald-cut of the stone is the perfect piece to liven up your ensemble whether at a party or on a date. The soft yellow gold color of the band allows the aquamarine to take center stage. We guarantee our Emerald-Cut Aquamarine Solitaire Ring, 14K Yellow Gold to be high quality, authentic jewelry, as described above.